Lightweight Chairs Conveniently Provide Multiple Uses And Can Be Used Both Indoors And Outdoors. Use Them As Chairs With Either A 6" High Seat Or 9" High Seat. Or, Flip Them Over To Use Them As A Table Or A Seat For Adults. Chairs Are Made From Nontoxic, Recyclable Polyethylene For Safe Use By Everyone..
Lightweight Chairs Conveniently Provide Multiple Uses And Can Be Used Both Indoors And Outdoors. Use Them As Chairs With Either A 6" High Seat Or 9" High Seat. 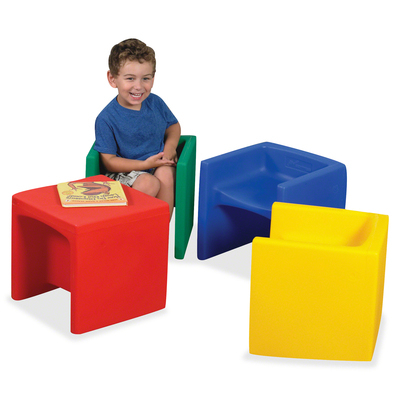 Or, Flip Them Over To Use Them As A Table Or A Seat For Adults. Chairs Are Made From Nontoxic, Recyclable Polyethylene For Safe Use By Everyone.